As a Knowledge Exchange Coordinator for the George and Fay Yee Centre for Healthcare Innovation (CHI) and the Developmental Origins of Chronic Disease in Children (DEVOTION) Network, Leanne’s work supports stakeholder and patient engagement. In this blog, she discusses insights from Jan Sanderson, a former deputy minister and former CEO of the Government of Manitoba’s Healthy Child Manitoba strategy for over 25 years. A great quote I recently saw used in a presentation is “if government pays, they also pay attention”. But getting your work on the radar of decision-makers (such as politicians) isn’t something most researchers have been trained in. This ties in well within the world of knowledge translation where an overarching goal is to move the latest evidence into healthcare practice or evidence-informed public policy. There is agreement that we need to get better at bridging the gap to get evidence into the hands of policy makers, in a way that they can use it. So how do you get your message across to said decision makers? Whereas in academia, you’re playing the ‘long’ game and building your case with evidence, politics is more about quick snippets of information and short attention spans. Which departments and which decision-makers have an interest in this issue? How can I engage them before the study even begins? Who are the community leaders who have an interest and can act as champions for the work? Does your research address or connect to a political priority or election commitment? Could your research potentially resolve a political problem? What are the risks — is your research controversial, or could your findings alienate or engage a voter base within your community? Check your assumptions with potential political champions, stakeholders, and implementers. 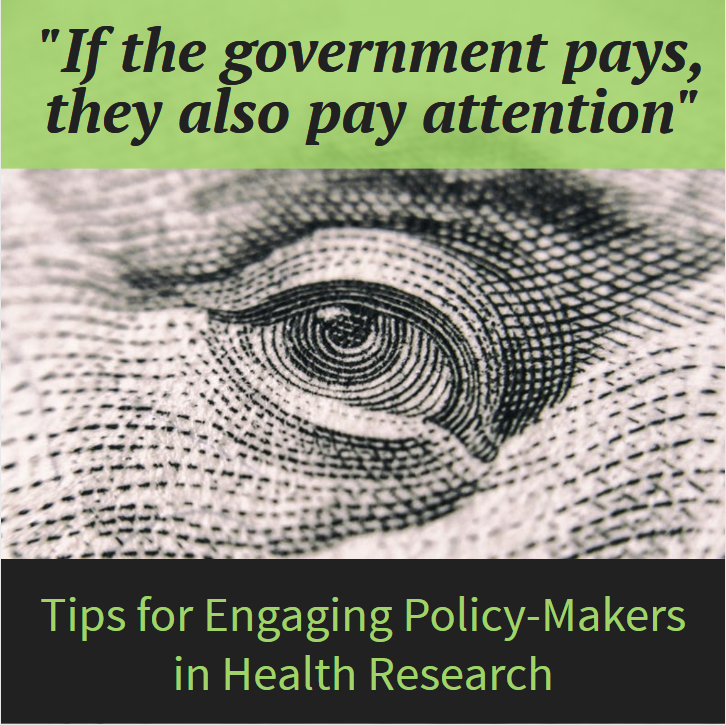 Test your approach and message with someone in the public policy field (if you’ve got one!). Take your message to the most appropriate, most senior official(s) you can access by using the network you have built to open the door(s). Including perspectives from other people on your team (for example, a community partner or person with lived experience). From my experience working for the DEVOTION Network, I’ve seen the development of a collaboration with decision-makers from Healthy Child Manitoba and the Regional Health Authorities. The goal of this two-way exchange is to design interventions aimed at improving early childhood health. For example, we recently held a Knowledge Translation workshop in Thompson, Manitoba for a project called “Factors Associated with Inadequate Care among Women in Northern Manitoba” headed by Dr. Patricia Gregory. The goal of this workshop was to bring together diverse perspectives of people living and working in the north to co-design future interventions for improving prenatal care. As part of planning this workshop, DEVOTION has begun a collaborative relationship with the CEO of the Northern Regional Health Authority, which will help to bridge the gap between study results, healthcare practice, and policy to improve maternal and child health. The overall take home message from Jan and my experiences is that there is value in building mutually respectful relationships with decision-makers (such as government officials) because it could one day open the door to knowledge transfer in the world of policy and health systems. Although it may not happen for years, there is huge potential for creating allies that could one day lead to the opportunity to make an impact with your research. Know-do gaps. Integrated KT. Patient & public engagement. KT research. Multimedia tools & dissemination. And the occasional puppy. Publishing weekly, we focus on all things knowledge translation (KT) – synthesis, exchange, application & dissemination – from a health perspective. Topics include the science of KT, patient engagement, and media & dissemination.